Scholar Says Cruiser Trips to Cuba Successful. (Prensa Latina) Researcher and professor of Tourism in Havana University, Jose Luis Perello, described today as successful cruiser travel to this Caribbean nation. In an interview witjh the scholar, published by digital newsletter Caribbean News Digital (CND), Perello said that after a September characterized by the damages of hurricane Irma and other woes, this vacation modality revived. He mentioned that October ended favorably with a growth rate of 4.3 percent compared to the same month of 2016. He said other negative factors like the alleged sonic attacks on U.S. diplomats in the Cuban capital, without evidence on the part of Washington authorities, as well as the new measures to hinder travel to Cuba, with additional migratory restrictions to travel to the island. US pulls staff from Cuba over ‘specific attacks’. 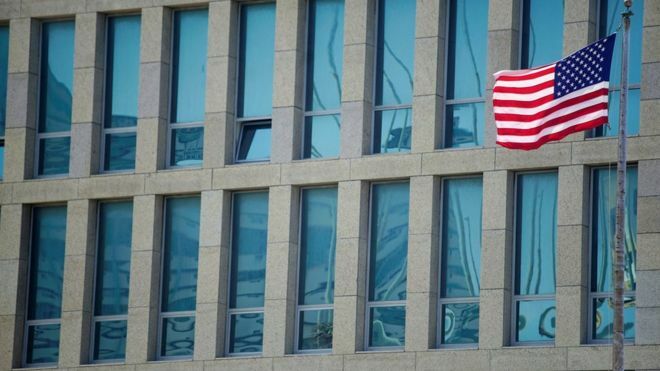 The US is withdrawing more than half of its staff at its embassy in Cuba in response to mysterious attacks which left its diplomats unwell. US Congresswoman Calls for Uniting Efforts for Engaging Cuba. (Prensa Latina) Democratic Congresswoman Yvette Clarke is one of the lawmakers who calls today in the United States for engaging Cuba, despite the new restrictions announced by President Donald Trump. Clarke, a daughter of Jamaican immigrants and a legislator in the ninth district of New York, called on her colleagues in the House and Senate to unite in an effort to restore the ‘practical and common sense approach’ of former President Barack Obama (2009 -2017) towards the island. Obama worked to transcend past mistakes and build a future defined by the common interests and aspirations of the United States and Cuba, Clarke told content-provider Caribbean Media Corporation.